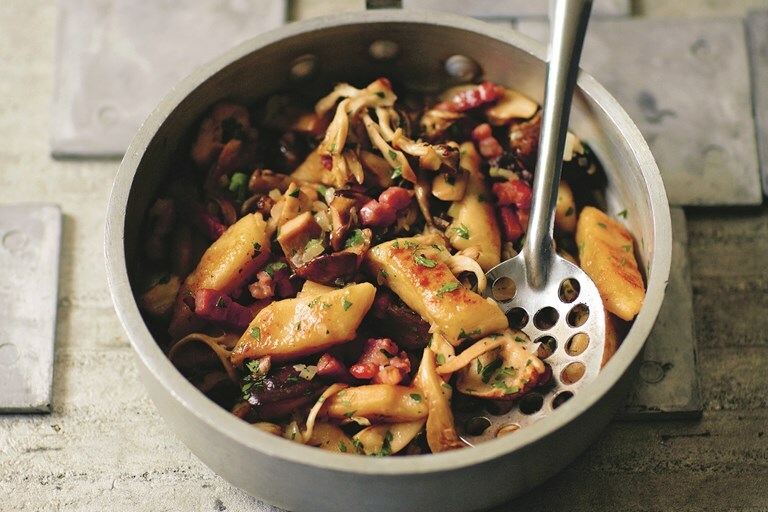 Ren Behan's kopyta recipe is served with bacon and mushrooms for a lovely autumnal twist. Often called 'Polish gnocchi', kopyta are simple to make and incredibly comforting to eat. Extracted from Wild Honey and Rye by Ren Behan, published by Pavilion. Photographs by Yuki Sugiura. Kopytka translates as ‘little hooves’ and they are sometimes described as Polish gnocchi because they are similar to Italian gnocchi. Some Poles also call these paluszki, which means ‘little fingers’. I sometimes experiment with gluten-free flour and I like to make these with almond flour. These can be served sweet, too, with melted butter and a sprinkle of sugar, drizzle of honey or maple syrup – even for breakfast. If you add twaróg, Polish soft cheese, to the dough, you end up with leniwe, ‘lazy dumplings’. In the Ukraine, these are made simply with cheese, egg and flour and called halushky.